Distribution and habitat: Kalanchoe blossfeldiana is native to the island of Madagascar, where it grows in the relatively cool plateaus of the Tsarantanana Mountains. In its natural habitat, Kalanchoe blossfeldiana grows in humus soil and forms small upright shrubs. It has thick, waxy foliage with a succulent appearance. In the greenhouse, Kalanchoe blossfeldiana is grown as a flowering pot plant and is considered a biennial or even a triennial plant, meaning it takes two or three years from seed germination to reach the flowering stage, after which it is discarded. Description: Kalanchoe blossfeldiana is a long-flowering perennial succulent that is rarely seen in its original form, having been superseded by a number of improved forms. These have become popular flowering plants to be bought in full bloom, during the winter and discarded when the flowering season has passed. Most are 30-35cm (12-14 inch) tall and bushy; the leaves are thick, fleshy, dark green, often edged with red, more or less circular and 2-3cm (0.8-1 inch) long. They carry their flower erect. The small flowers are arranged in dense clusters of between 20 and 50, each cluster spreading at least 3-4cm (1-1.5 inch). They will continue to bloom for two or three months. Kalanchoe blossfeldiana‘s hybrids make a big diversity display of forms and colours. The clasic Kalanchoe blossfeldiana‘s flowers consist of four petals that form a tubular-shape flower and can be red, yellow, orange, pink, purple and variant of these, but some hybrids have more that one row of petals. 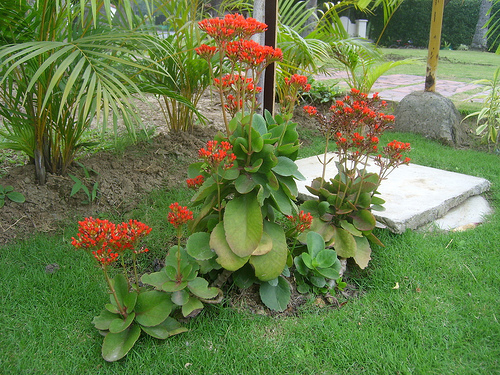 Houseplant care: Kalanchoe blossfeldiana is usually discarded after flowering. However, if it is pruned back hard and given spell in the garden, it will probably flower again next season. They grow best in clay pots for aeration and need drainage holes in the bottom. Setting the container on a dish filled with rocks or gravel provides extra drainage. 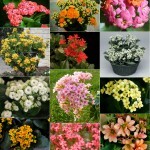 Light: Kalanchoe blossfeldiana should be grown in sunny window. 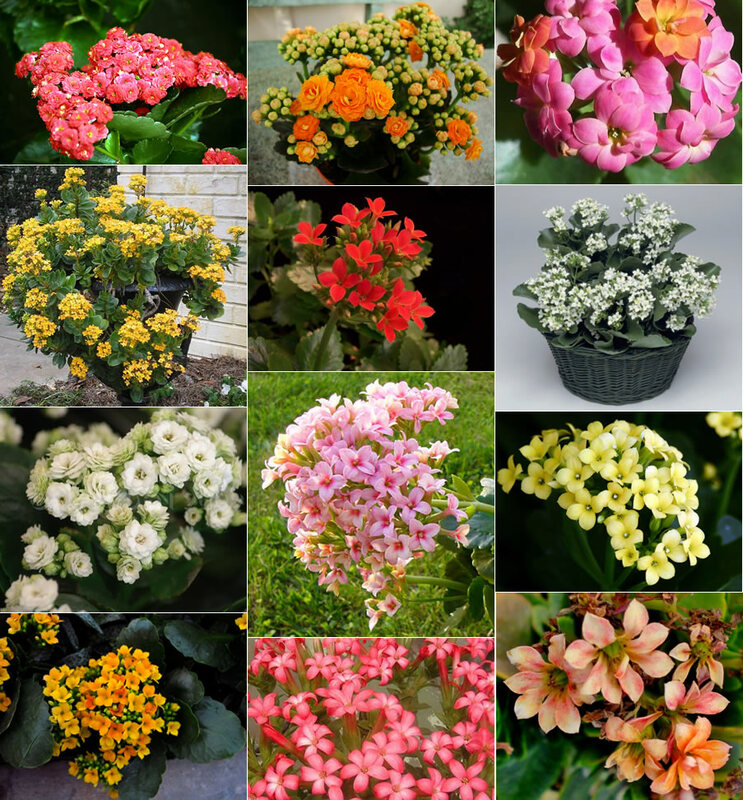 When growing kalanchoe in containers, they can be boosted to produce more buds and flowers by giving them 8 to 10 hours of sunlight per day. 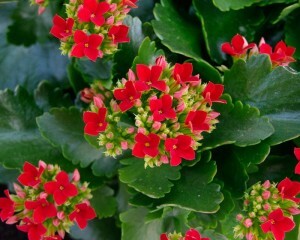 Temperature: Kalanchoe blossfeldiana grow well in normal room temperatures. Avoid temperatures below 5°C (40°F) because they can kill Kalanchoe blossfeldiana plant after a few hours. Water: During the active growth period water sparingly – just enough to keep the potting mixture moist, allowing the top half of the mixture to dry out between waterings. Kalanchoe blossfeldiana have the tendency to become abnormally gross and flabby if they are overwatered. Avoid using cold water when watering plants because it could shock the plant. Fertilising: Apply week liquid fertiliser once or twice to flowering plants, during the growing season only. Pruned plants may be given a dose of full strength fertilising as a boost. Potting and repotting: Use a soil based potting mixture with the addition of a small amount of coarse sand. Plants that are not to be discarded should be moved each spring into pots one size larger. Good drainage is important; have a shallow layer of clay-pot fragments at the bottom of the pot. The maximum pot size needed should be about 13cm (5 inch). Propagation: To propagate Kalanchoe blossfeldiana take tip cuttings in spring and root them in 8cm (3 inch) pots filled with a mixture of peat moss and sand. Pot pots in a warm position in bright filtered light. Water the mixture whenever the top 1-2cm (0.4-0.8 inch) dries out. When roots have formed and new growth appears, move each young plant into a pot of standard mixture. Make sure that the pot is large enough to hold the roots. 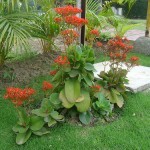 Thereafter, it should be possible to treat the plant as a mature Kalanchoe blossfeldiana. Problems: Kalanchoe blossfeldiana is relatively trouble free. Susceptible to stem rot, if over-watered. Honeydew, galls and distorted leaves are a sign for an infestation with aphids. Treatment: Use a suitable insecticide and follow the instruction from the label. Waxy fibres and honeydew on leaves and shoots indicate an infestation with mealybugs. A powdery white coat on the plants indicates an infection with powdery mildew. Treatment: Remove affected plants and apply a fungicide. To prevent infection improve ventilation, keep the roots moist and do not water the plants from above. White tufts or white covering on the lower surface of the leaves indicates an infection with downy mildew. Treatment: Remove infected plants. Avoid fungal infection by improving drainage and by avoiding over-fertilization. Uses: Kalanchoe blossfeldiana, when container grown, are ideal for sunrooms and bright windowsills and can be grown on the porch or patio. It is suited for hanging baskets, container plant and as indoor plant. In garden, Kalanchoe blossfeldiana can be used in border, ground cover and makes a stunning plant for rock gardens. Kalanchoe blossfeldiana ‘Tom Thumb’ is a miniature form never more than 15cm (6 inch) high with reddish foliage that carries small dark red flowers. Kalanchoe blossfeldiana ‘Vulcan’ is a long bloomer miniature form with large scarlet flowers and grows up to 20cm (8 inch), blooming in 20 weeks from seed. Kalanchoe blossfeldiana ‘Compacta Lilliput’ is a miniature form with red flowers that grows no more than 15cm (6 inch). Kalanchoe blossfeldiana ‘Orange Triumph’ is a less frequently seen orange-flowered kind. Kalanchoe blossfeldiana ‘Goldrand’ is an less usually form with yellow flowers.